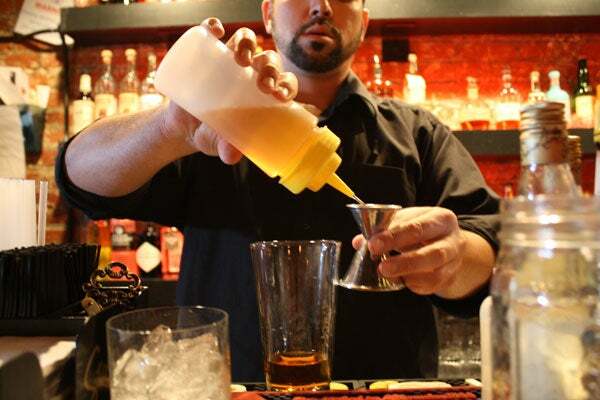 Ever walked into a fancy bar and marveled at the array of house-made syrups, flavored with fruits, spices, and herbs? Or sampled a terrific cocktail and wondered just how the bartender got it to taste just right? Well, infused simple syrups — and their so-trendy-right-now counterpart, shrubs — are an easy way to take cocktails (and even mock-tails) to the next level. And since we love mixing our own drinks at home, we're fully on board with capturing seasonal flavors in our own elixirs. To give our DIY dreams so direction, two bloggers-slash-bartenders are putting on a pretty sweet class this week. Dana Onyewu and Anthony Rivera will teach you how to make syrups and shrubs, how to best utilize them in your cocktail recipes, and how to invent your own flavorful creations. The $35 ticket gets you three cocktails, appetizers galore, and hands-on instruction — plus, you'll get to bottle your own custom syrup to take home. Cheers to that! When: Tuesday, August 28; 7-8:30 p.m.
Where: One Lounge, 1606 20th Street NW; 202-299-0909.